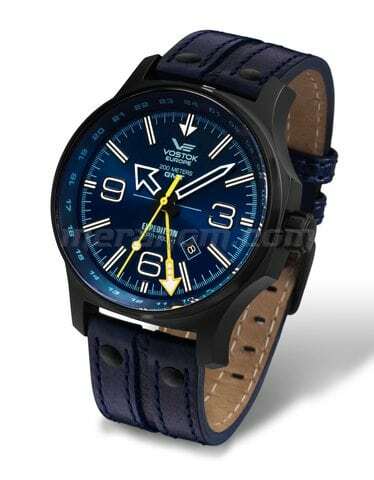 This deep, rich blue dial version of the first dual-time Expedition from Vostok-Europe is an attention grabber against the black PVD case. The dual-time Expedition North Pole 1 models from Vostok-Europe bring together the precision of the Swiss Ronda movement with the ruggedness of the Vostok-Europe Expedition North Pole watch line. This is one of the most attainable VE watches to come out in a long time, with all four models under $400. The dual time function is set independently for the fourth hand, essentially a second hour hand, and makes this watch great for travel. All the other features of the Expedition North Pole 1 are still there -- 200 meter water resistant (professional dive quality) surgical grade stainless steel, K1 mineral crystal and that awesome, double thick, double tang buckle strap.